Sir Vivian Richards, Aravinda De Silva, Ricky Ponting, Adam Gilchrist, wondering what’s common amongst there cricketers? All these are absolute legends of the game not just because of their records but all of them have a century to their name in a World Cup final, that too in a winning cause. Team India has lifted the World Cup trophy twice. First, the Kapil Dev-led side won in 1983 and then 28 years later, MS Dhoni and his men created history in 2011. But no Indian player scored a century in both finals. Well, there was one man who came agonizingly close to the immortal milestone – Gautam Gambhir. We remember India’s victory in 2011 for the heroics of MS Dhoni. The then Indian captain, against all odds, tackled the poor form in the tournament and brought glory to the country. His winning shot over long-on, the gaze to cherish his own power and the score of 91*, that was a moment made in heaven. Many believe it was the best knock an Indian ever simply because he soaked in the pressure of the big stage and brought the team home. But under the charismatic captain’s knock, an innings got suppressed that made all the glory possible. Well before Dhoni struck the winning shot, it was Gautam Gambhir who set the plot. The left-hander often doesn’t get the credit he deserves for the near-perfect innings. When the Indian openers Sachin Tendulkar and Virender Sehwag walked out to bat at the Wankhede against Sri Lanka in the pursuit of 275, all eyes were on the duo. The opening pair had made cricket-watching a treat for a number of years. Sehwag had opened his account with a boundary in all of the match thus far. He took the strike but against him, this time, was Lasith Malinga. Off just the second ball, the slinger trapped Sehwag in front and the opener departed without scoring. The hopes then rested on the great Tendulkar who was playing his last World Cup and the dream of winning it was still not achieved. The Master Blaster was on 99 international hundreds at that time. Signing off from the World Cups with the hundredth hundred and an Indian win would have been a fairy tale. Tendulkar struck a couple of marvelous boundaries that brought the whole of Wankhede and the nation on its feet. The hope just got bigger. But once again, it was Malinga who proved to be a thorn in the flesh for India. Tendulkar went to chase a wide delivery, an outside edge that carried to Kumar Sangakkara. The Sri Lankans were the only ones who made noise that time. The whole of Wankhede was stunned silent. India could see the dream slipping away. The score read 31/2 in the 6th over. It took a while for the fans to recover from the shock they got after Tendulkar’s dismissal. Meanwhile, Gautam Gambhir and Virat Kohli came together in the middle. It wasn’t the Kohli of today who could chase down scores for fun. He was just emerging in cricket at that time. Gambhir was the senior partner and he played the role brilliantly. After seeing off the pacers and the new ball, it was important to rebuild the innings. The duo began to collect the singles and scored the odd boundary. It was the month of April and in Mumbai, it gets very humid especially near the ocean. 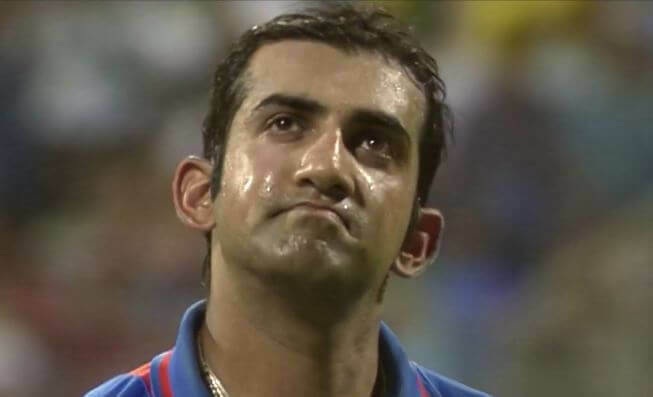 It was evident as the color of Gambhir’s jersey had changed due to heavy sweat. If Sachin Tendulkar was playing his last World Cup, so was Muttiah Muralitharan in the other camp. The Sri Lankan legend held the key in the big final. Had he started picking up wickets, India would have bundled out quickly. But Gambhir was adamant. He kept battling and brought up his half-century. The hope was back amongst the Indian fans. Now the partnership was flourishing. But against the run of play, Kohli lost his wicket for 35 to Dilshan. Another setback for the hosts and once again, there was a fear that the dream would be broken. Yuvraj Singh, who had been India’s best player in the tournament, would have been the best bet to come in next. All of a sudden, it was the Indian captain who came out to bat. He had been out of touch throughout the tournament. But Dhoni had the perfect partner at that moment. Gautam Gambhir had seen it all – the pacers, the spinners, the pitch, the weather. He continued in his usual demeanor while Dhoni took his time to hit the stripes. The chase was then flourishing. Sri Lanka was left clueless as the Indian pair simply ran away with the game. Gautam Gambhir was into the 90s and India was on the road to victory. Out of nowhere, Gambhir danced down the wicket to Thisara Perera and attempted an expensive drive. He missed the ball that cannoned into the stumps. It was a heartbreak as he missed the most glorified century by just 3 runs. He had to walk back for 97 from 122 balls. His knock was all about grit as he hit just 9 boundaries and not a single six. Gambhir walked back and Dhoni did the rest. Not taking any credit away from Dhoni but it’s fair to say that he stole the show. India lifted the World Cup Trophy after 28 years and everyone was talking about Dhoni. Does Gautam Gambhir get the credit he deserves? Unfortunately, even today, no. The Delhi-lad has now called time on his cricketing days. If we look back at his career, we remember him for his gutsy batting, aggressive nature and inspirational captaincy for KKR. Had he got those 3 more runs, his place in Indian cricketing history would have been even more special.